You must try this Sticky Rice Bread recipe! The texture is ultra-soft with a bouncy texture. Recipe is adapted from Lady & Pups with some modifications to the timing and quantities to suit the size of my loaf pan. Thank you to Mandy, the author of Lady & Pups for sharing this amazing recipe. 325g strong bread flour (I used Japanese high gluten flour) Please read note below. In a sauce pan, combine sticky rice flour and water. 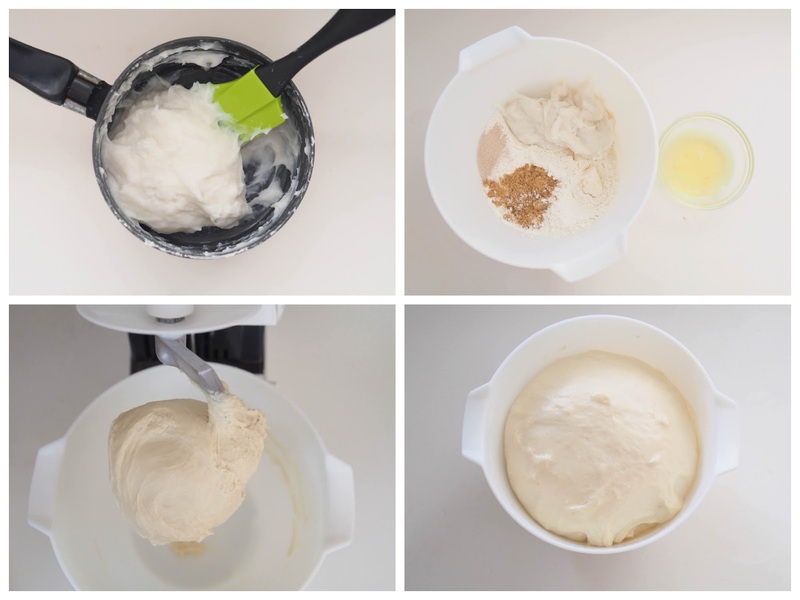 Mix with whisk or spatula until no lumps. Cook over medium-low heat, stirring consistently until the mixture becomes thicker and gooey. Remove from heat and set aside to let it cool. Line the baking trays with parchment paper. Put all ingredients (start with salt, bread flour, yeast, sugar, butter, egg white and cooked sticky rice mixture) into the bowl of stand mixer. Using the dough hook attachement, knead on low speed until all ingredients have come together. Turn to medium speed and knead for about 20 minutes or until the dough become very sticky, smooth and elastic. If the dough is too wet, add 1 tablespoon of flour at a time. Let the dough rise in a warm place for 1 ½ hours to 2 hours or until double in size in a large greased bowl, covered with cling film or kitchen towel. Normally, I just left the dough in the mixing bowl and covered with kitchen towel. Punch down the dough to release the air. Transfer the dough to a clean floured surface then divide into 3 equal portions. 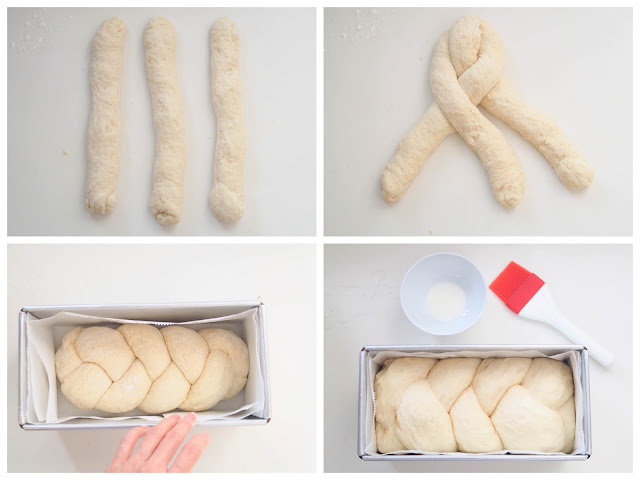 Form each dough into a strand (about 12 inch long) and braid them together. Place the braided dough in the prepared baking pan. Let it rise for another 50 - 60 minutes or until double in size in a warm and dark place. 15 minutes before baking, preheat the oven to 200C. Brush with egg wash or milk and bake for 30 minutes, or until golden brown. 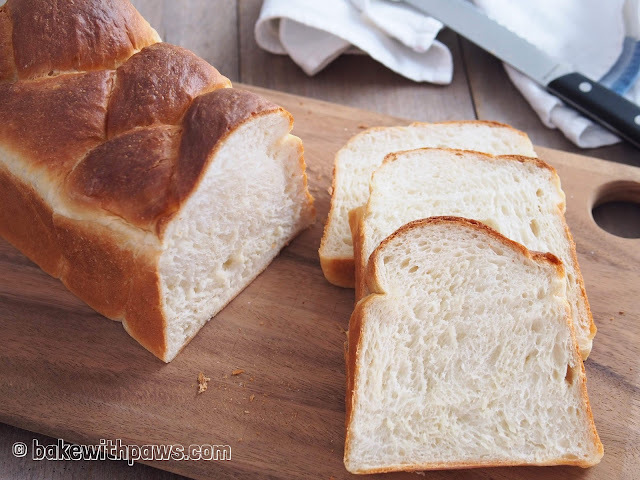 Remove bread to cool on rack before slicing. Please use strong bread flour that approximately 14% protein. 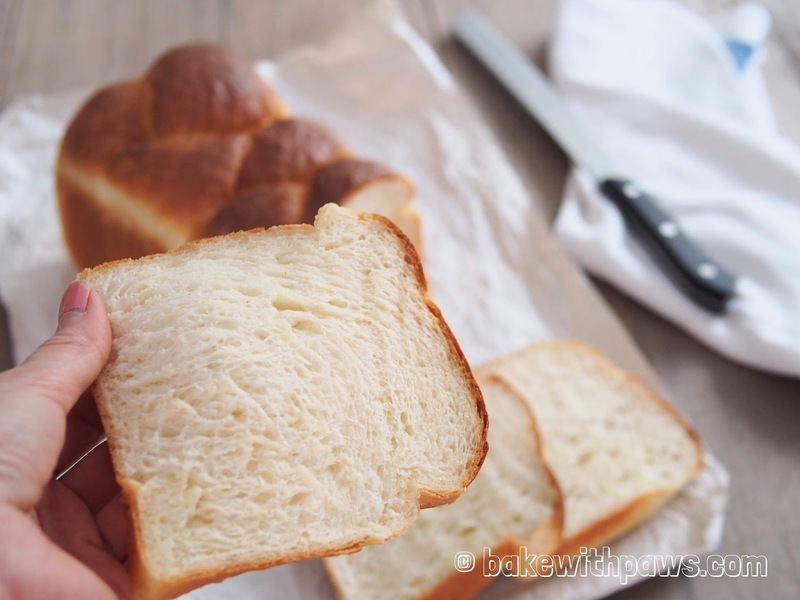 I have experimented twice with Japanese Bread flour, which did not indicate high gluten. The dough turned out wet and it was not successful. I tried with Japanese High Gluten Bread flour and the result was good.